Normally taking the Shiv Ganga Express to Varanasi from Delhi, I opted for the Swatantrata S Express last time in order to have a couple more hours of daylight on the train. It paid off. 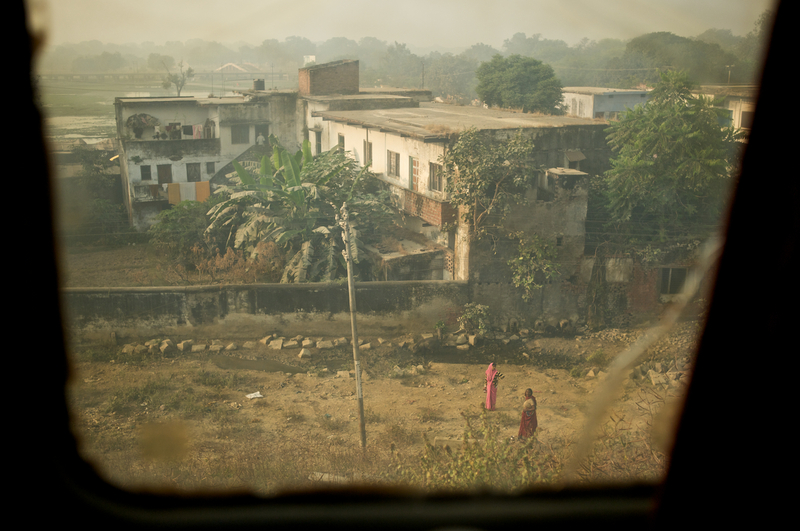 What follows is one morning shooting out the window from the 2nd Tier AC section of the Swantantrata Express. So kick back, get a cup of chai, and enjoy the journey. Advertise these in the right places and they could be in any gallery in NYC …I’ve seen much worse containing much fewer. i’d love to get these in a gallery exhibit. Breathtaking — how your little window to the outside world could capture such real and beautiful moments. thanks ria, indian village life is really beautiful! new delhi, lived there past 3.5 years. never travelled to varanasi. have to try out just for the heck of it! varanasi seems like a “must visit” type of place to me. Thank you for taking me back home through your pictures. That lonely boy on the tracks, the two women in colorful saris, the school children waiting to cross the rail tracks, the multitude of people waiting at the rail gate are scenes so familiar, so dear and I miss them so. Your photo blog made me happy. Thank you! Thanks, I’m glad it made you happy, and that it brought back some good memories for you. I love it when photos invoke that. Amazing pictures! You should have a book printed with these images. Thanks Carlie, I plan to create some books in due time. Smashing perspective. Very well executed. Fantastic! Love the concept of watching the scenery and lives change through one window. Love the pictures and the concept. 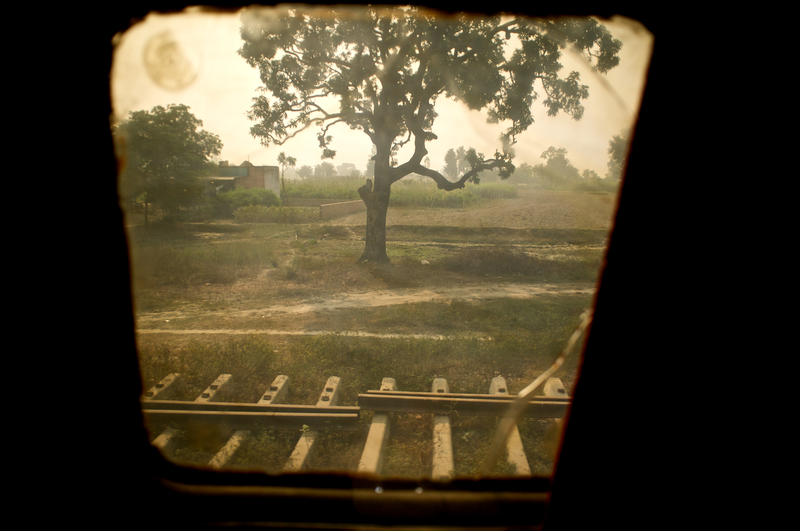 I took a 36-hours train from Agra to Calcutta once, an incredible experience…! indian trains are an amazing experience! This caught my eye in “freshly pressed.” Makes me miss India all the more, as I remember the long train ride from Bombay to Delhi. Can’t wait to go back and see it all again! hope you make it back soon! Thank you for this window into India. I am curious — did anybody wave at you as the train passed and did you wave back? I gave a few head nods to passengers in other trains as we slowly rolled through various stations. Otherwise, I was simply trying to capture real life and stay low key. It was a fun project. These pictures are stunning and inspiring!! Brilliant post, can’t wait to see more! This is simply amazing, so beautiful and consistent quality in shots, Cannot wait to see more! Well done! Very inspiring! Really wonderful photos, I love the way they’ve been framed – they have a timeless feel to them. 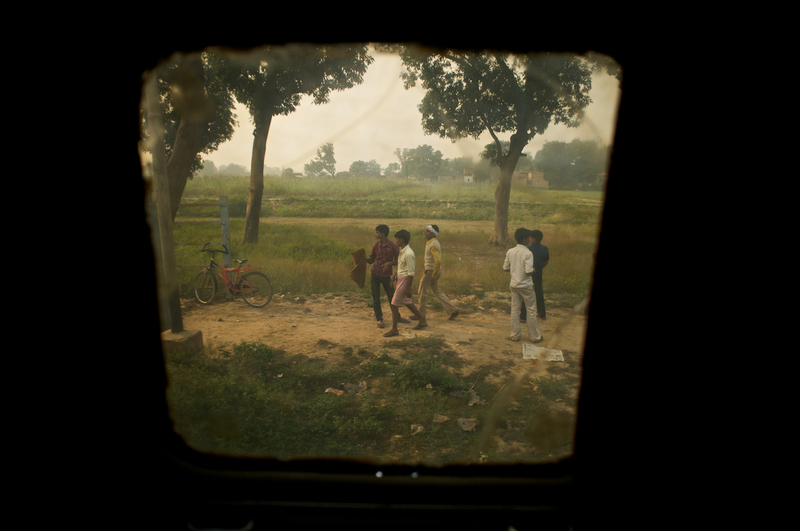 I was in Varanasi September 2011 and had a wonderful time though my train back to Delhi was an experience – I was almost kicked off the train and spent the rest of journey at the back of the train! Beautiful! 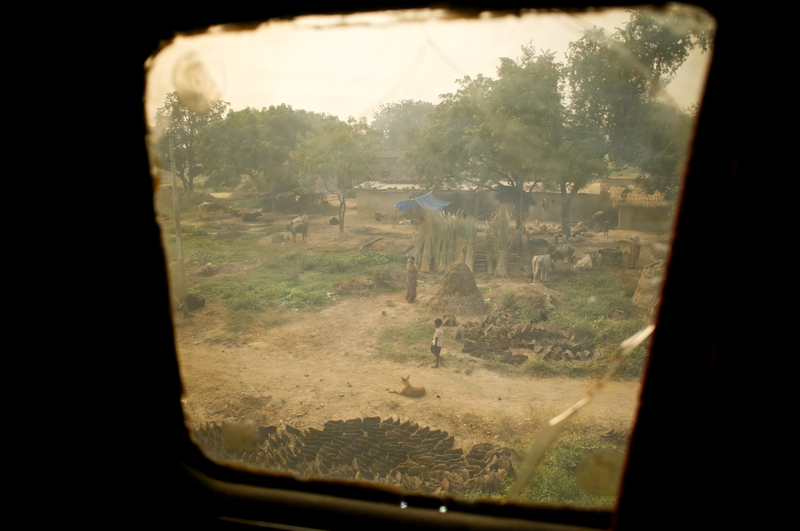 Love the way the train window frames the photos. It gives a sense of place and interesting tone to the whole collection. Thanks for sharing! thanks laura, appreciate the kind words. 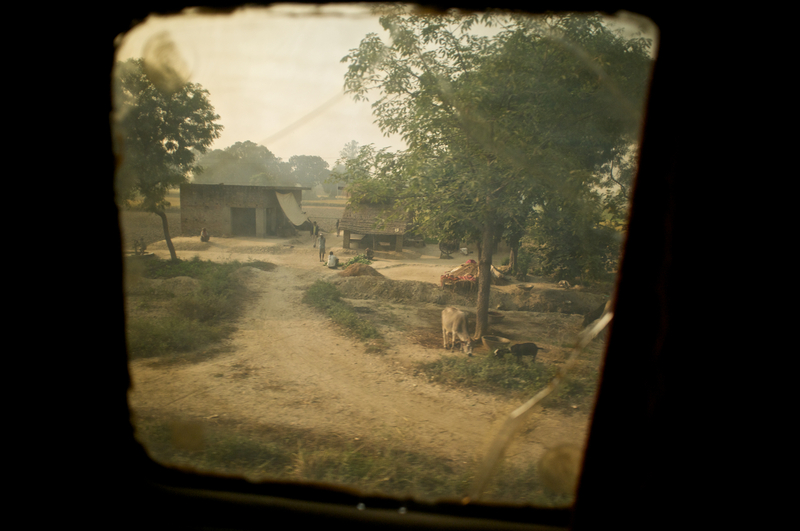 I remember this trip as though it was yesterday, lovely pictures, takes me right back to my first train journey out in India !! Amazing frames and the concept. Great shots. 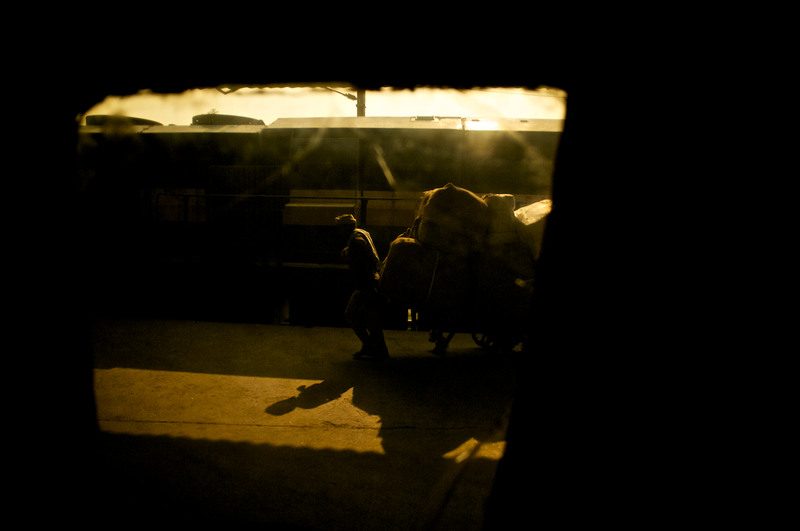 Brings back a trainride I took from Calcutta to the far north-east of India last year. A brilliant place. hope you make it to incredible india! My humblest thanks 🙂 I did venture through to magical India and I hope to create another lengthier journey soon. How unique! Very beatiful, thte countriside of a country is the most exciting thing about travelling I think! 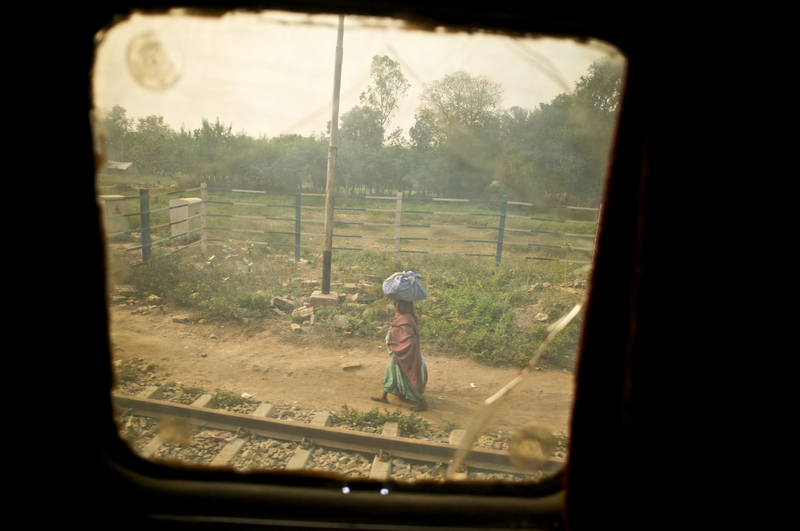 I just love those long train rides across Indian soil. Thanks for reminding me. I am moving there in two days and really cannot wait to rediscover India. i hope india is treating you well! 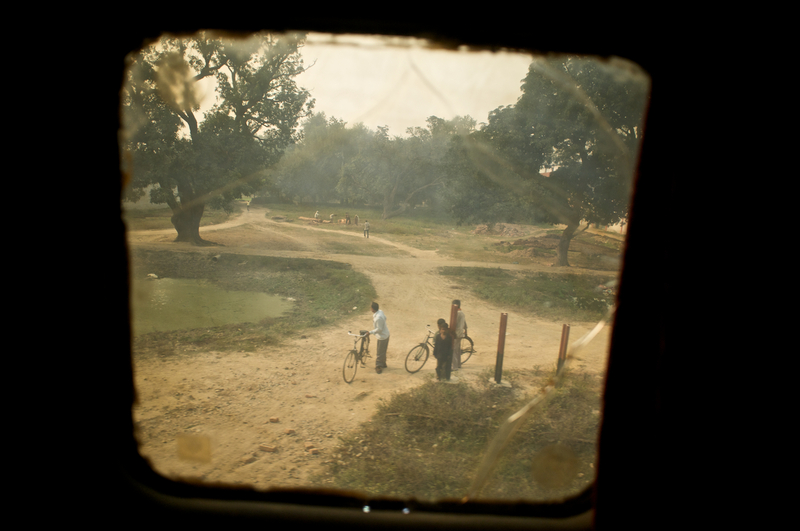 This reminds me of my journey from Calcutta to Bubeneshwar! I love the way you have shown the people in their everyday activities. We stopped for 20 minutes above a village and I think everyone from the teacher to the field worker to the tax collector walked or cycled by. Wouldnt work in Britain very often because people are usually further away but recently a train I was on stpped by a small farmstead in Yorkshire. I took a few and got a wave! Keep up the brilliant picturing! Thank you! From Mumbai to Daman one person tried to push me off the seat and two others cheered when I pushed back! Others offered me roll ups. When I returned to UK I got culture shock because it was so cold-hearted and no one talked to one another! 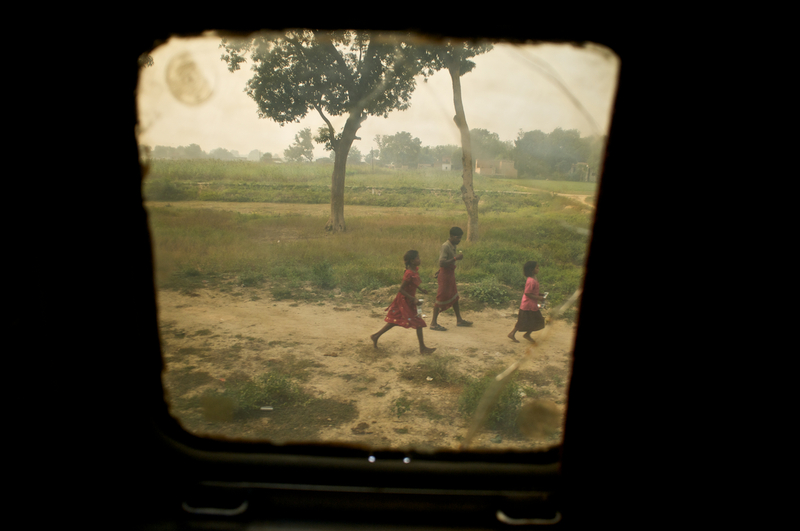 You’ve brought back many good memories for me of train rides from Delhi to Kanpur (my mom’s hometown in the state of Uttar Pradesh.) 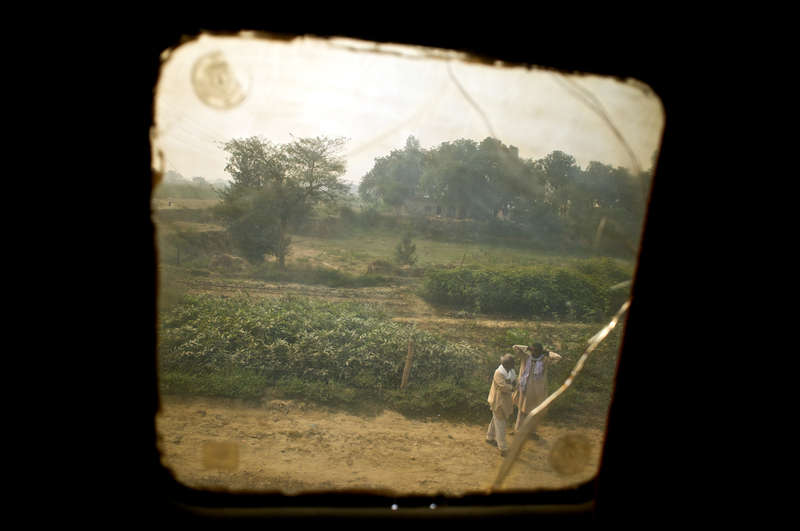 Before I got married, I went to India every two to three years to visit extended family. Because of my husband’s job, I haven’t back to India in nine years and I feel a deep longing for my family and for the country. Thank you for the photo gallery! 🙂 a beautiful portrait. Very intimist!! I LOVE your photos. 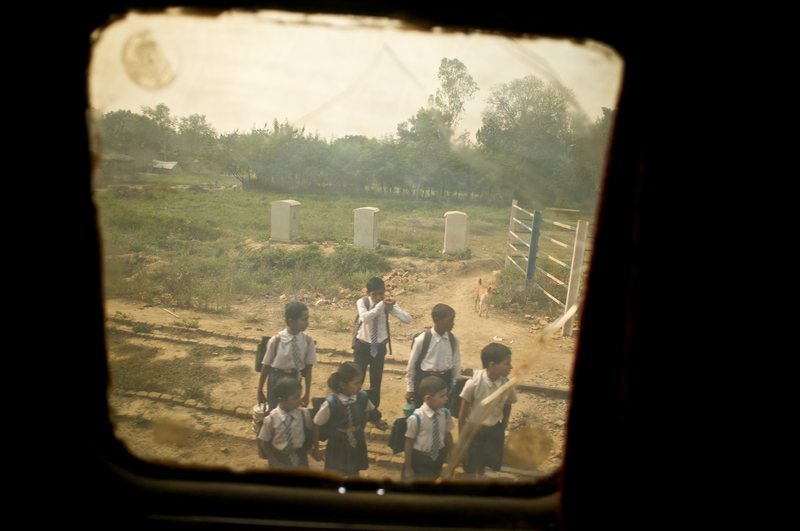 Wish I had ridden the train when I was in India. Great post! really well done. perfect actually. 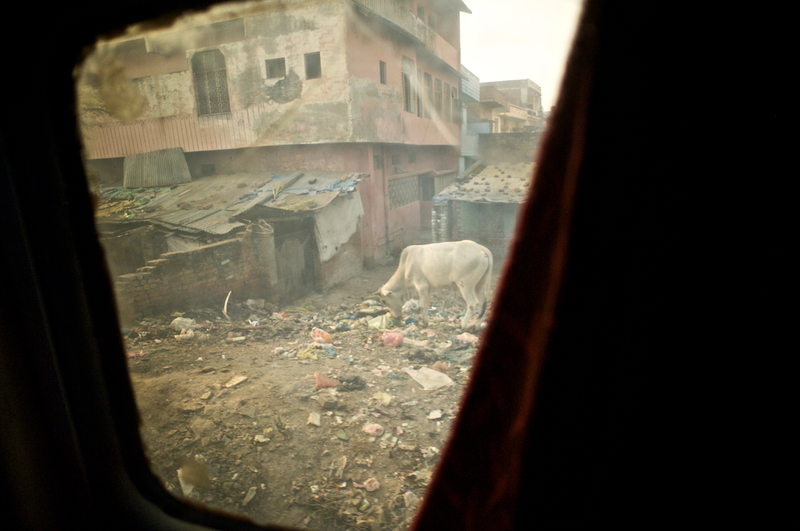 These photos show India as it truly is. The framing gives a strange sensation of actually being at that train. very cool. now i want to take a train ride. Wow. What a very interesting and repetitive set of images. Repetitive in a good way of course. 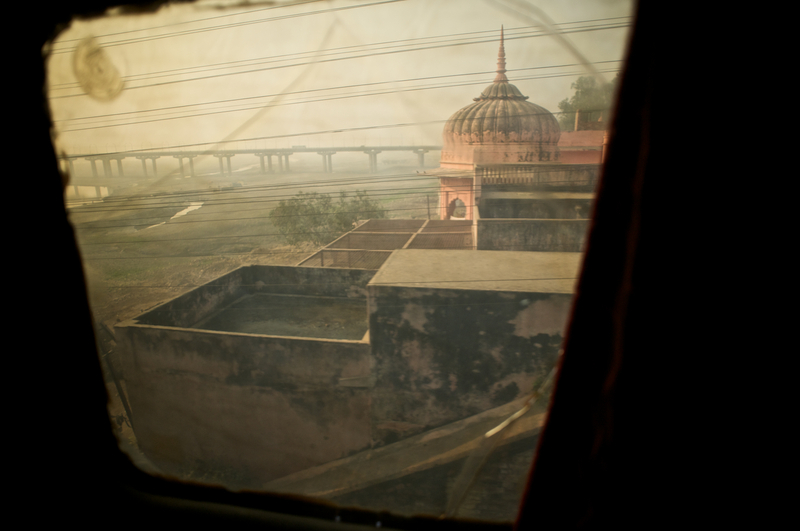 It really ties the theme together and makes me feel like I am on the train watching the people of New Delhi myself. Wow, thank for the journey! I really enjoyed it. Very interesting series. Magnificent pictures! I especially like the window of the train providing the border–it reminds me of looking at pictures through a “viewfinder”. it does have that feel about it, doesn’t it? fantastic-the window works as a really interesting border, somehow making the photos look like glimpses into the everyday life of the people you pass on the train. Without the window, these photos would have only been good, rather than something really special. thank you. i agree, that window was vital to making this project work. thanks. I have seen it. I have clicked it. I have experience it. But never was able to create magic like you have done here. Brilliant story line kind of effect. Loved it! i appreciate those kind words! thanks! i trust you are enjoying laos, it remains one of my favorite countries. i took a very remote and untraveled route out of phongsali and relaxed in luang prabang after traveling the mekong. what an amazing country! I was there 4 months ago and i can say that those pictures reminds me a lot the hours that i spent travelling between Delhi, Varanasi and other cities. I didn’t traveled by train but bus, so i haven’t experienced this magnificent view from this small window. You gave us an excellent feeling of your trip. If there were also some pictures from inside the train it could have been even better. I appreciate that feedback, and I agree. Original idea. I like the shots a lot. 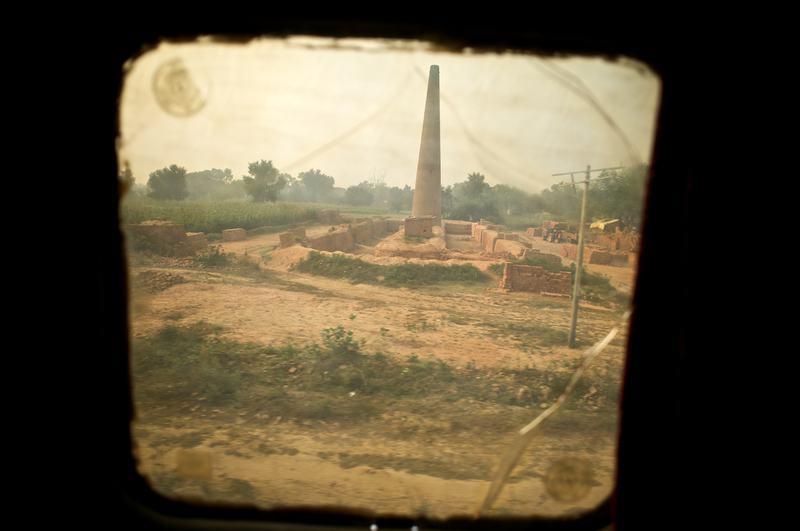 It seems time has stood still for some parts of India – so removed from the modern world. So refreshing. 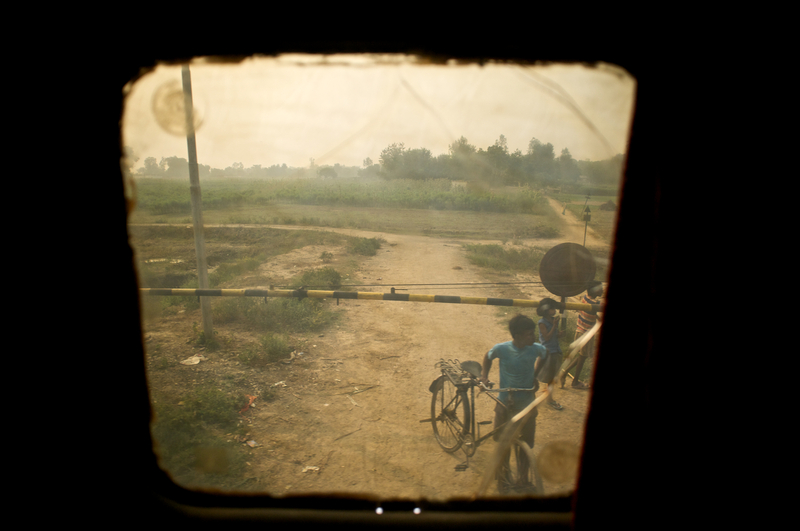 what a great collection of photographs…I lived in mumbai for 1.5 years and we caught the agra-varanasi train…so much fun and the best piping hot chai in the morning! Wow, that’s great. congrats on getting freshly pressed again. Keep up the good work. yeah rick, those were some good days. 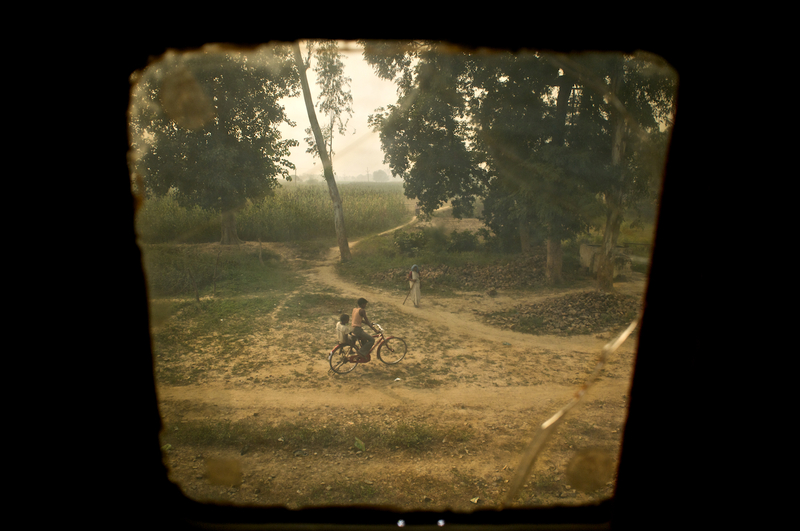 What a great way to capture pictures of India! I was only there for a few days and did the drive from Delhi to Agra which took six hours there and five hours back. I wish I would have taken photographs as the sights were unbelievable. I remember seeing the cows eating garbage too. It made me sad. Great collection of work! Amazing photos! Great site. Very interesting. The simplicity with which the people you have captured appear to live by is utterly breathtaking. There is something so angelic and soothing about looking through your photos, thank you for posting! – Roisin. The window creates a stunning framing device. You images make me reconsider returning to India, and that says a lot! I was referring to the way you ‘framed’ the image by using the window. This framing device allows you to focus our attention on a specific image, while at the same time limiting what the viewer can see. The dirty and broken glass also plays a part in limiting our vision. There is also a certain voyeuristic quality as we look out on the lives of complete strangers, which adds an interesting subtext to the image. As a result, we get a candid look into the lives of these people but from a detached distance. I have no idea how this makes me sycophantic. I was simply complimenting you on your skill as a photographer in terms of creating an interesting narrative. What a beautiful perspective into life being lived!! Excellent work Russ! 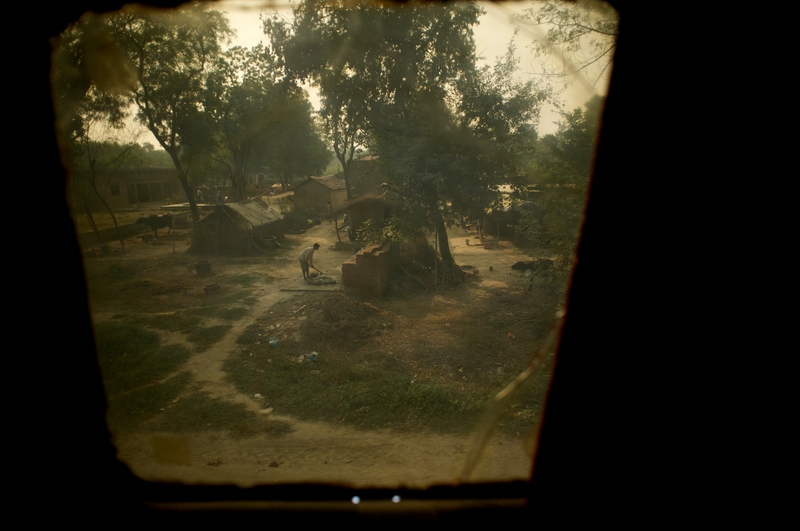 these are great shots of India. Makes me miss it. wonderful, reminded me of travelling to my village in Pakistan, such familiar sights! Novelistic and original photographs. I imagined all the stories that went with the photographs. I felt like I was watching a movie from the 1960s or 1970s. Thanks, I think the framing of the window brings to mind a roll of film and it feels as though you’re holding a roll of film up to the light and looking through it. The golden tint on the windows does seem to give them an aged quality. I’m glad you liked them. Thanks for giving us such a lovely trip through a (for me) different world. Very original idea and very unique pictures ! 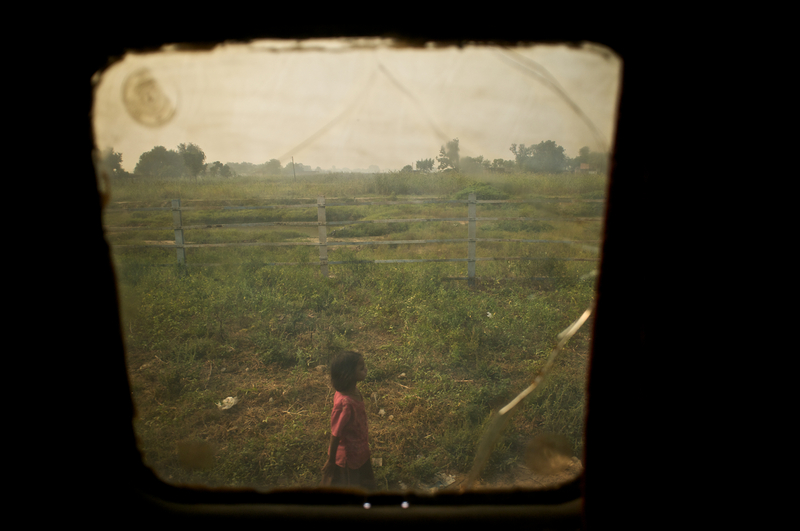 thank you for the train ride.. beautiful photos. Incredibly beautiful. It reminds me of the life-changing trip I had to India at age 14. What a spectacular country – I can’t wait to go back! Amazing stuff and very unique! These are great photos. They remind me of Ben Lowy’s work in Iraq. http://benlowy.com/ But he used the frame of a tank. thanks erin, i checked out ben lowy’s work. a truly fascinating look at war. India’s train journey practically as we see. Thumbs up! Reblogged this on Vinit Agarwal's space. BTW, Congratz for freshly pressed. Unique way to present your train ride. Each photo tells it’s own story. Nice job! Beautiful glimpses of a place we hear about all the time, but rarely are able to see. Even pictures are usually of only the cities. Thanks for the pictures, they’re truly terrific. this is awesome!!! too good. i’ll have to include those next time! Love the way these give one the sense of looking into something rather than looking at or looking out at something–so fine and full of wonder. You really get the idea that they have less in a physical sense, but not emotionally. In fact, it appears that they may have more, simply because they cherish what little they do have and aren’t busy worried about what they don’t. Also, the countryside is just gorgeous. Thank you for the experience! What a great blog post! This reminded me of the “view master” where you could click with anticipation of the next picture to show up. I love how you framed all your photos with your window. Each new picture was a delightful surprise. Hope you’ll have a great week! All these years of train travelling in India, this idea never crossed my mind.. Unique & brilliant.. Instead of looking into the details of every pic, try scrolling down at a medium pace from the first to the last pic.. i liked the movie-like effect it creates..
thanks, that is a good way to view these. Wow, It looks like an old TV screen. How many hours it takes to travel between those cities by train? simple reality on one train ride. thanks for taking the journey! Great trip. Did you enjoyed trains? 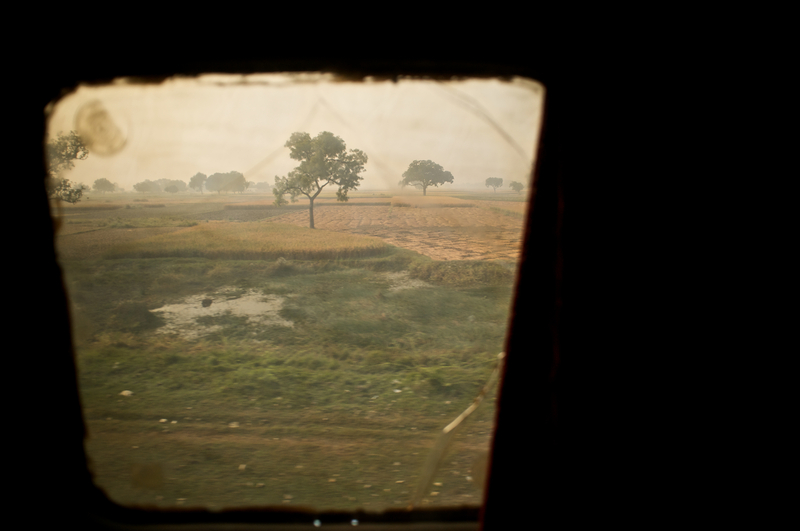 We spent 48h in indian trains with my wife when were travelling around India. 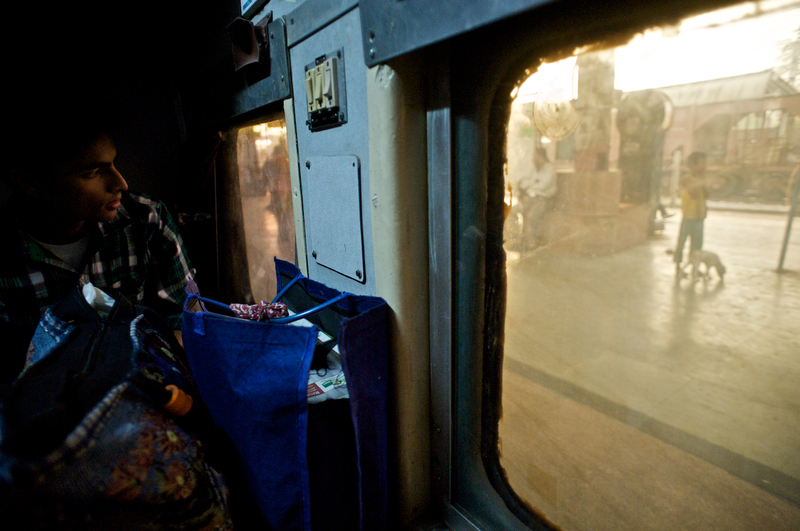 I think there’s nothing better than a night train, the rails are my favorite way to travel India! Have just recently returned from 4 months in India. Did lots of train journeys and your pictures just brought it all back to me. They are fab. My first visit to your site….but sorry to say not a very good experience in terms of photograph quality and background selection. It would have been better, If you had decided to visit Varanasi through road. But thanks to your post with some images presenting life of Indian villages. Nice concept. I especially like the idea of taking all photos from the same angle. Well executed! Loved it! At first I thought it would have been better to click pictures from a sleeper coach than the AC coach. But you changed my perspective completely. Amazing how the window adds a different dimension to your pictures. 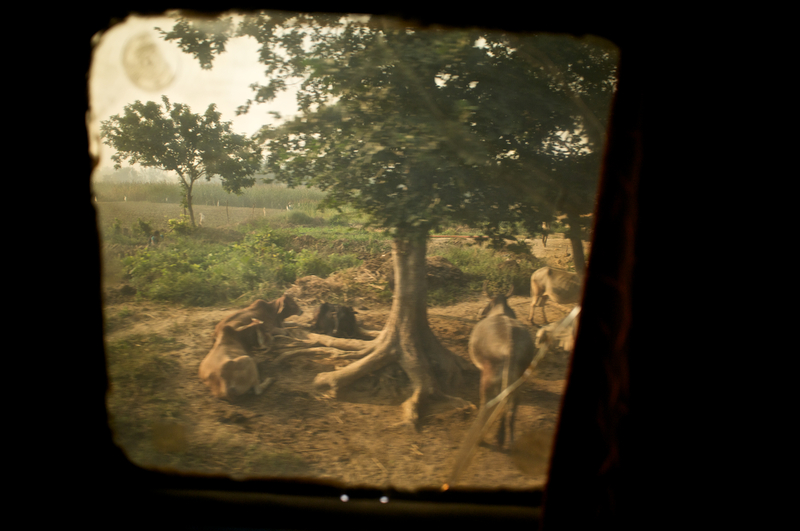 It also reminded me of my journey to Varanasi from Pune. Wow. One of a kind! I love the idea … “live capture from window”. Great photos. I almost feel like I’m being transported back in time. Beautiful photographs! Reminds me of the time I went to India. It was a rich, learning and amazing experience! Thanks for sharing and congrats on being freshly pressed! 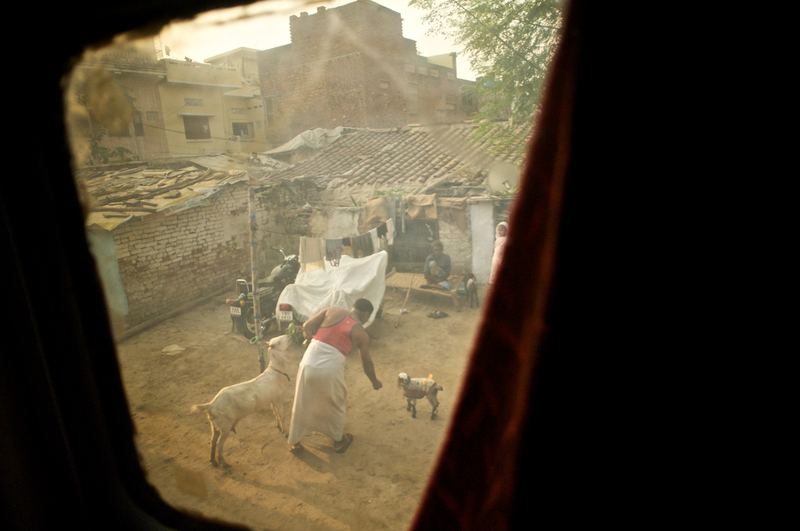 Ive never been to Varanasi from Dellhi…but now, i wud want to..
Lovely concept and beautifully done. 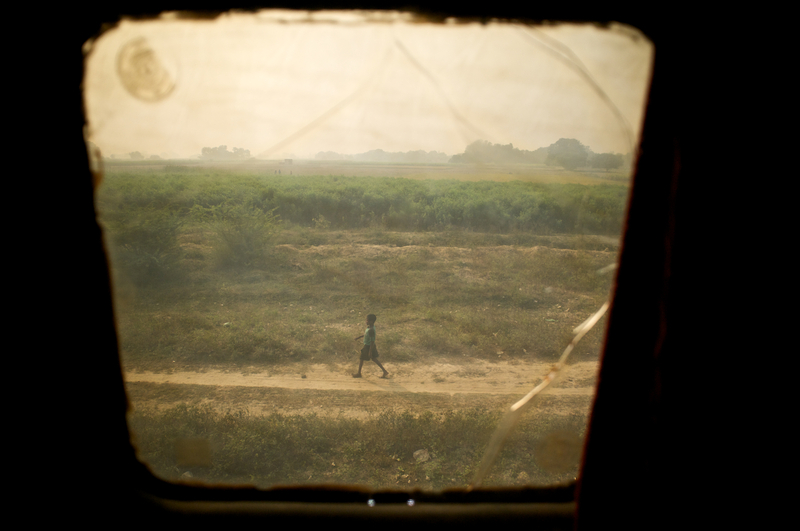 It’s commendable that you got such decent exposure through those misty AC coach double window panes. Many times when I travel, I am so filled by an experience that I decide to leave my camera buried in the bag. Thank you for taking these pictures, they speak to a similar time in my own life. Great job! The beauty of our country is so well captured! Agree with above – the trouble is trying to capture ‘real India’ when you are there, but you did it perfectly. And now I’m thinking of booking a flight and going back because your pictures made me miss it. Thank you for sharing – what a great start to my morning. Thanks, if this made you want to go back to India then I’ve done well. Appreciate it! Wonderful! Great framing of shots and a very thoughtful perspective! i took a 3rd class non-ac train from mumbai to varanasi. it’s the only way to travel india! 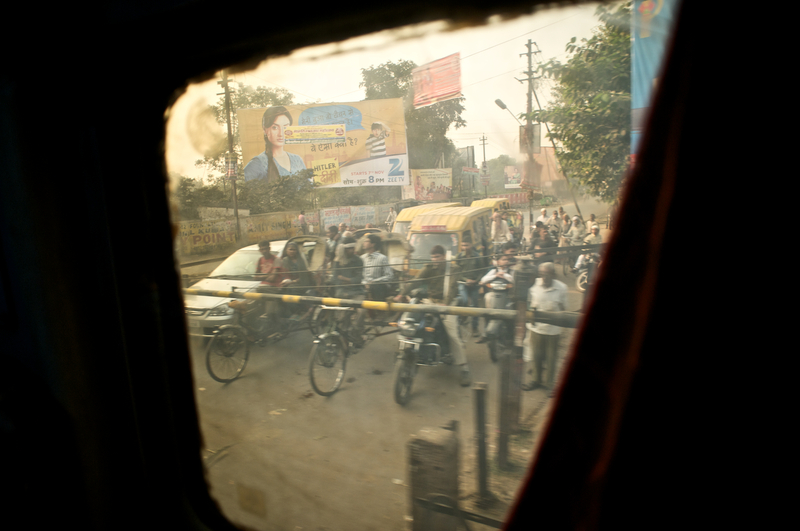 check it out http://jacobbmurphy.wordpress.com/2010/09/30/india-train-to-varanasi-and-my-first-day-in-varanasi/. SAFE TRAVELS! Great work! In 2nd Tier AC you get more middle-class Indian families and there is not quite the openness to being photographed. Your work is outstanding. I saw your photographs….some are very good…however, it seems you have intruded into privacy of some individuals. Also, there is no 3rd class in Indian train now. It has been removed long back. The coach in which you traveled is actually 2nd class sleeper coach which transforms into seating during day time. 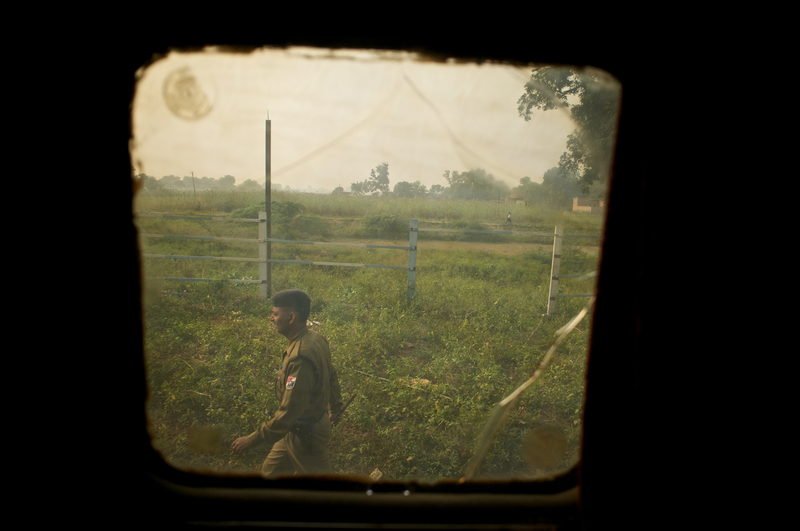 I did that journey in 1980, in a beat-up old carriage hitched to the train as part of Ashley Butterfield’s Indian Railway Tour. I’ve never been back. 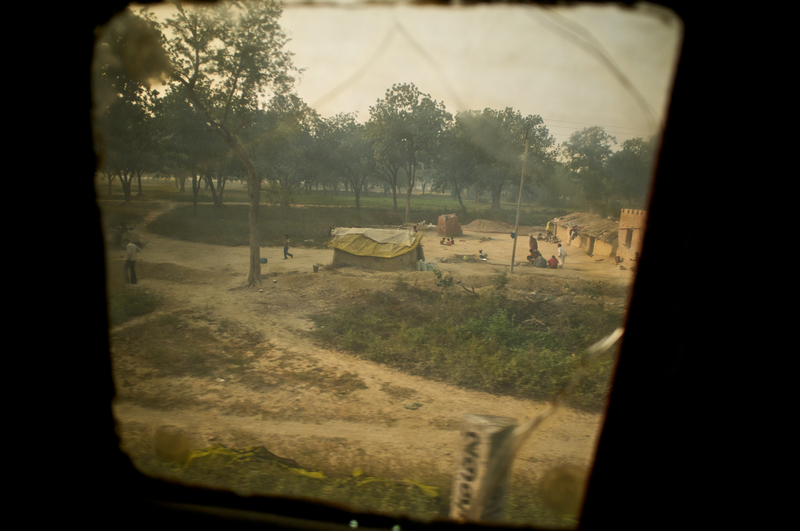 What’s amazing to me is that the view from the train has not changed in 30 years, in spite of everything we read and hear about the transformation of India in that time. So, a timeless gem! Thanks for the memory. James Stewart, Cardiff, Wales. Thanks for the kind words James, I’m glad it brought back some 30 year memories! Incredible journey, and I wanted to share. I have such a spot in my heart for India and her people. Enjoy! wow..i’m impressed….i wanna go to india someday:) but from here…from Romania…it’s very expensive…very nice photos:) good job!! awesome pictures. I would love to travel also by train in India someday. I’m sure there are a lot of interesting things to see. Lucky for you the window was clean, which it usually is not. I do feel like I took the entire ride with you. I absolutely love your style of photography! 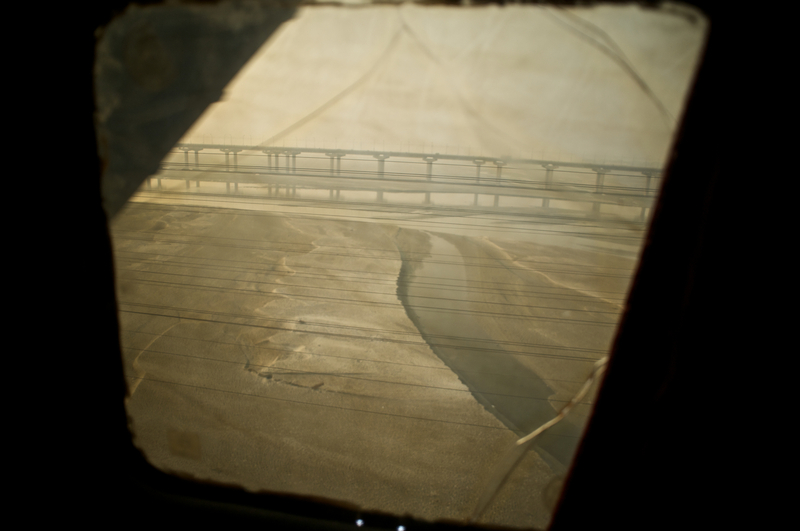 I am amazed that you got so many crystal-clear and sharp pictures from a moving train — and even through a dirty window. Great photography. My nephew just got back from spending 6 months in India doing some intense research on a Fulbright scholarship. He lived there with his wife and three very small children. I think the thing that touched them most was how so many of the people genuinely loved their little children. 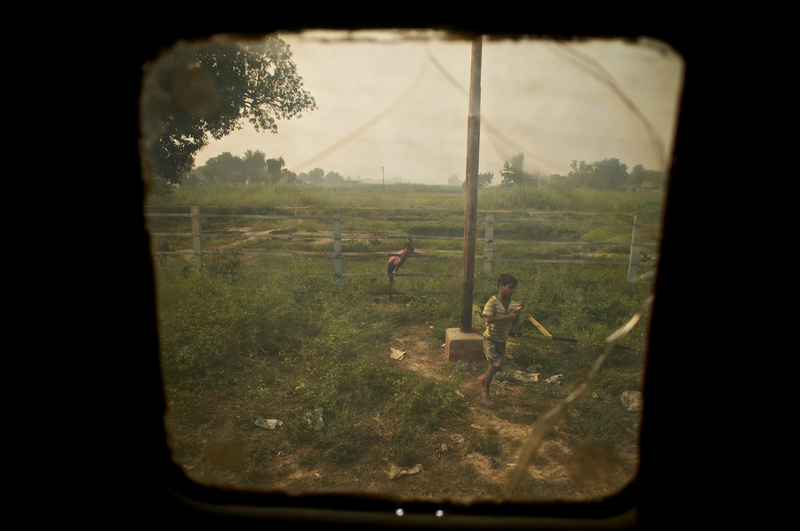 Loved the photographs.Being an Indian,I was was happy to see the real India shown in your blog. thanks, i’m always glad when my photographs connect with the people of the country! My country and my country men in your lens!! Good. Travel to every corner of our country. Let the whole world see the diversity and the varied culture, imbibed in this great land!!!!!!!!!!!!!!!!!!!!!!!!!!!!!!!!! of ours !!!!!!!!!!!!!! Wow, what a perfect glimpse into another world. Absolutely stunning images. I can almost feel as though I was riding on that train with you and watching daily life unfold. Congratulations on being Freshly Pressed! 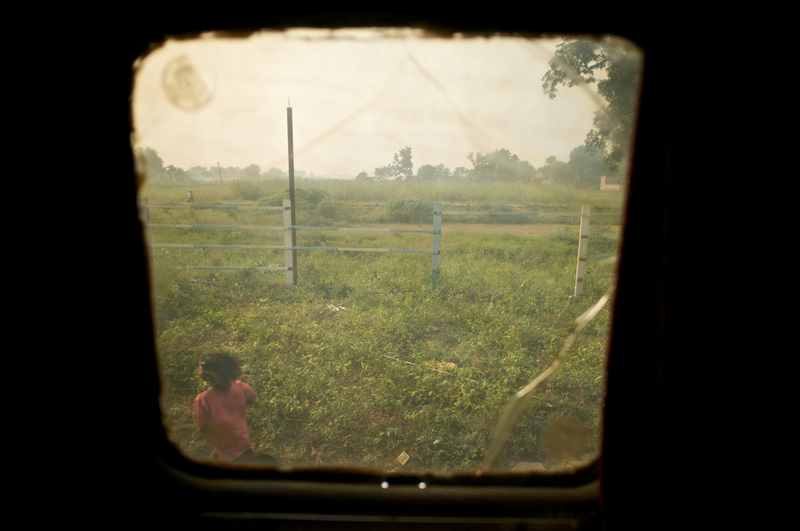 This concept of shooting through the train windows is offbeat and so intriguing! It makes one feel as if these are more than just post cards; it makes one feel as though one is actually there witnessing these scenes of real-life! thanks, i’m glad you felt that way! love this idea – very cool to show the journey through the little window. Feel like I went on the train ride. Thank you. ah, this makes me want to go back to India! Such a neat perspective, seeing the same cracks in the window in every frame, but a shifting view out the window. I loved this so much more than I can say! the old adage “see india through Indian railways” is a actually a different meaning, it says, if u travel india through trains. 3. you can cover the whole india. 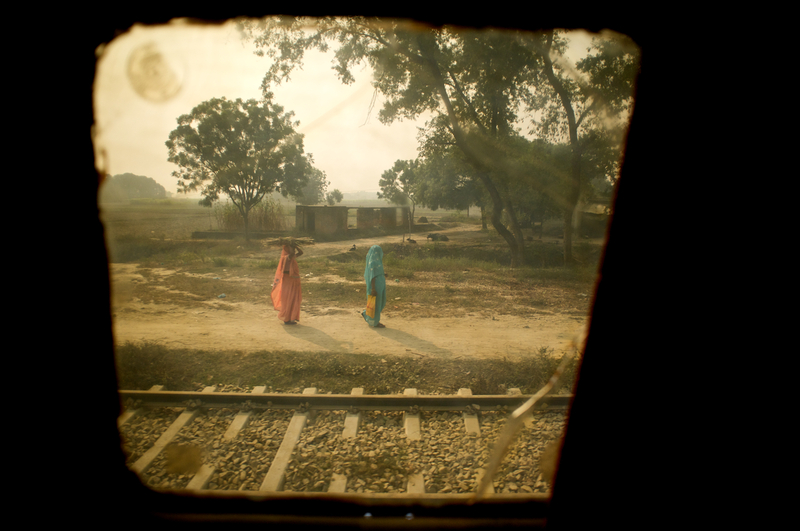 the pictures from the india trains is not what the actual india is…..
i believe that it does reflect a part of the actual india. yes, there are large middle class sections in india, there are wealthy people with their drivers, and mixed among them are the beggars at their windows. there are those who are buried in safron robes and those who are buried beneath a simple white sheet. there is the affluence of those who stay in 5 star hotels with the poor living just a block away on the corner of a street. india is full of juxtaposition and therein lies its beauty to many. 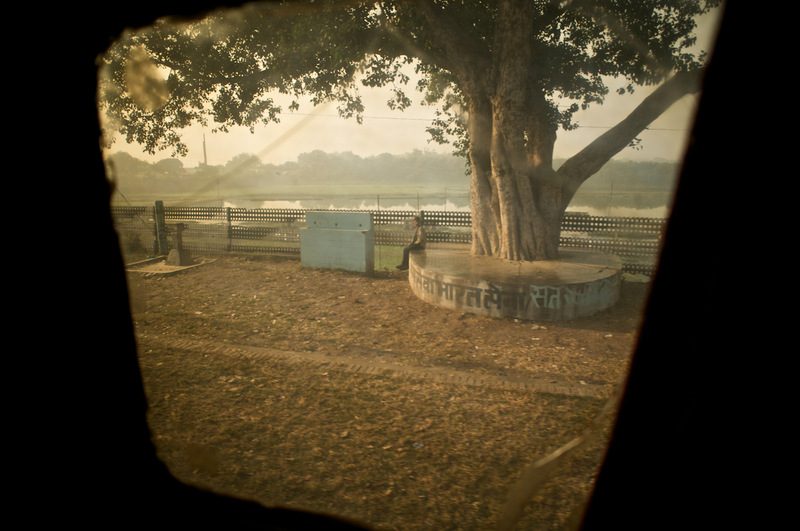 these images simply reflect how i saw and experienced india on one morning on a train to varanasi. Such a great idea. 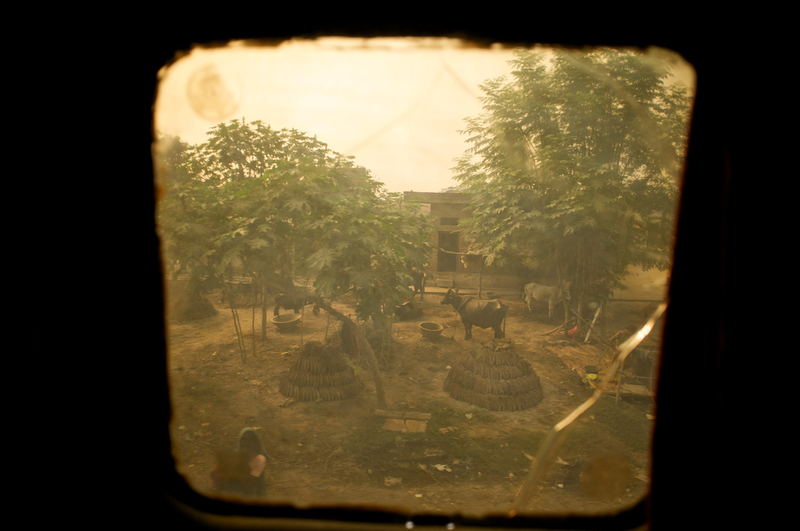 I love the way it frames the experience and this particular view of India. Nice to look at your photos ……….. a place that I hope I’ll be able to visit personally one day. Thanks for the info also. 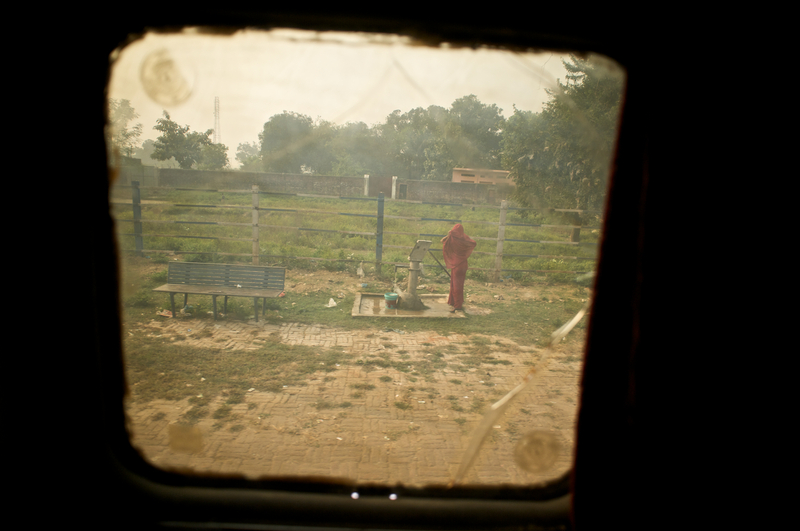 Relived memories of traveling by train in India. Would go on 2-night long train trips with family…seems like a long long time ago. Thank you and great job! Great photos. India is a place I’ve always wanted to see (and being such a big and diverse country, so many places within it as well). The train is such an awesome way to travel, too. Loved this! it is an awesome way to travel, and thanks! A really good idea that works well visually. Nice to be reminded of long Indian train jouneys too. Bloody brilliant! I felt like I was on that train! music to my ears, thanks! brilliant idea and very nice shots, captures the country in a unique way, hats off to you on a job well done! This post is so beautiful, its beauty is moving. 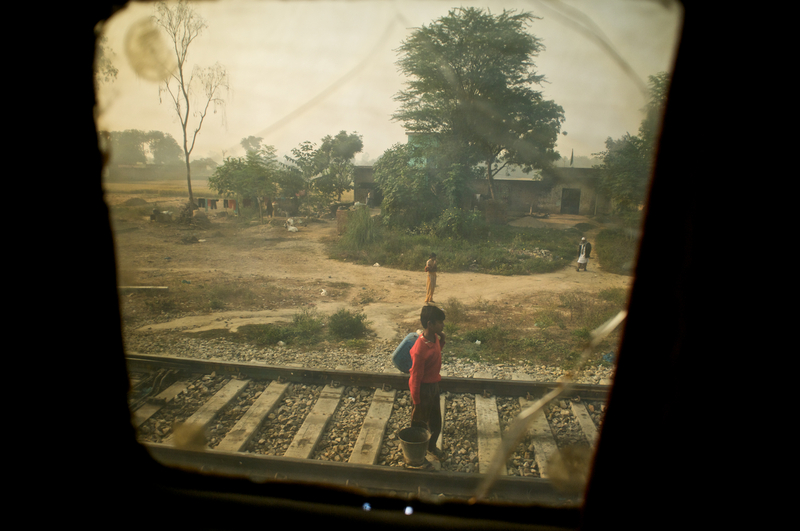 I took many trains when I was in India…I wish I had caught that atmosphere as you did. Beautiful, I did the opposite journey, Varanasi to New Delhi and was amazed at the scenery every few minutes. It brings back some memories of my trip to India last year. Congratulations on being freshly pressed. I went from Mumbai to Daman thrid class and someone tried to push me off my seat. I gained great respect in the cariage by pushing them back off my seat!! These journeys are so important for people to capture even a small shimmer of what is there. I love the way you concentrate upon the people!! Cool idea, great photos. I spent years (!) riding Indian trains, some of the most entertaining visuals anywhere! Thank you for sharing, have fun on the next trip, and have some ‘train’ samosa for all of us who miss them terribly! 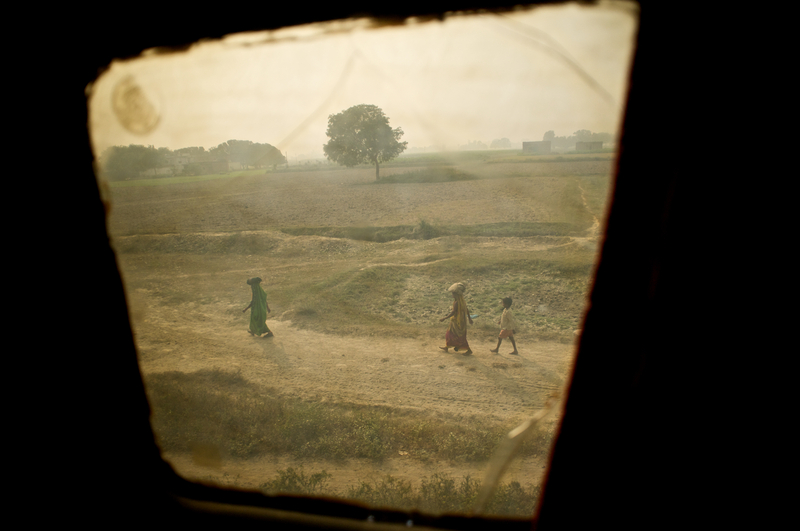 with 1billion population, its no way one single image of india is possible…. thanks for the reply appreciate it…. the change must be slow and from within. Nice framed pics… 😀 That’s awesome dude. 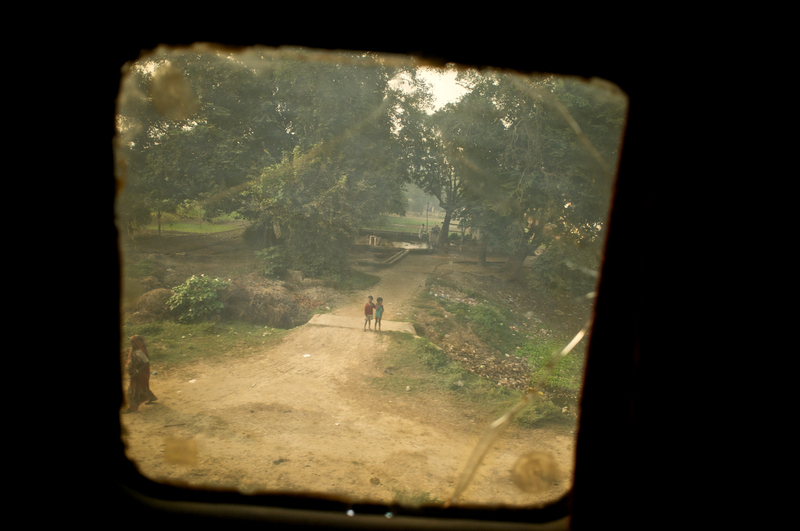 I documented the destination as well, and you’re right, I really did enjoy the journey…. Wonderful! Simultaneously captures movement and timelessness. Thx! I really love your photos. I got this same train and documented nothing. I also had a dead body on the bunk bellow me for the last 6 hours.. a crazy place. oh my, there’s a story there. and thanks for visiting and for you kind words! Love the hazing filtering effect shooting through the window provides. YOu make me feel like I’m sitting in that seat. Powerful. Hope to see India soon. Love the everyday, there, gritty feel! Wow. This is incredible. The whole world should see these, and explore this beautiful portal you have created. Magical. Thanks, I really would like to exhibit these. I can picture people walking through the room taking in each frame. 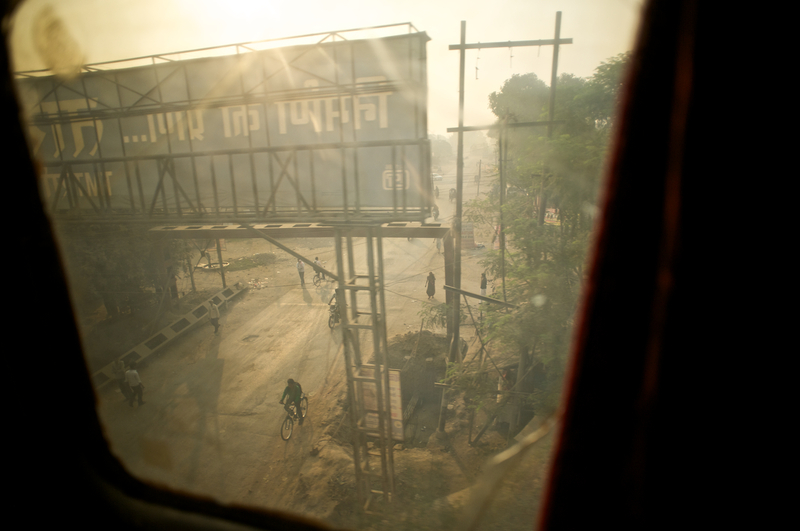 I believe I’ll have to do another Indian rail journey too, I miss incredible India. Great idea, really enjoyed this! It certainly helps re-create the feeling of true travel bliss as the world and it’s lives roll by… And that i need to get to india. Will you do more journey style posts? I tried one other post in journey-style in the American south from a car window, but it didn’t have nearly the same impact. There was something about being seated next to just the right window for framing those shots that added to the collection, I think. Yes, I do plan to do more, and the next time I plan an Indian rail journey you’re welcome to join in. 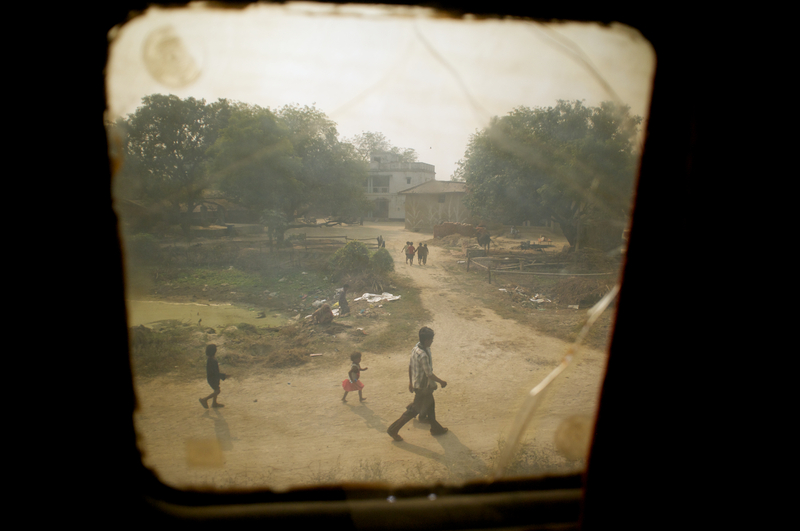 What a treat to see such well executed snaps from a train, just like being there. A exceptional window on Indian society! Thanks for riding along, and for the kind comments IC! Just come across your blog and beautiful photographs. 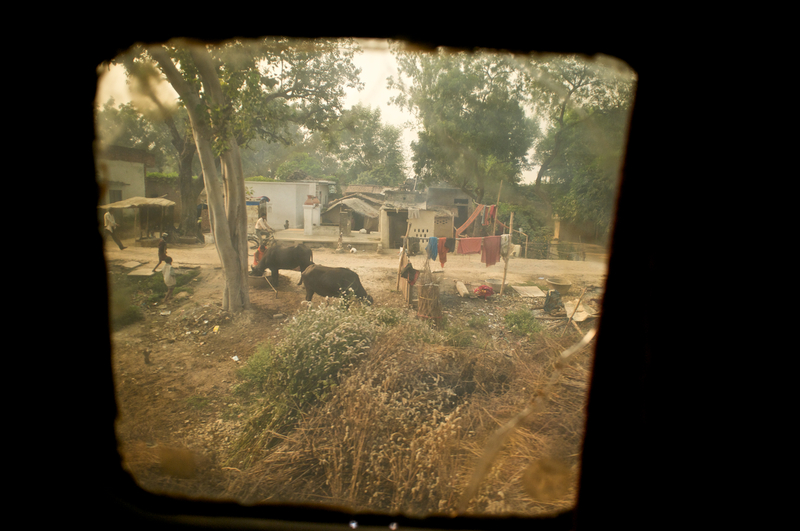 I particularly love the ones of India, such a great concept…you make me want to visit India. Thanks, as the trip went on, I looked at the window frame and decided instead of a distraction, it could become a photographic asset. Russ, these are bloody cool. Nothing short of fine art. Congrats, and Merry Christmas. J., Thanks! I truly appreciate that, Merry Christmas to you as well. Wow! I am blown away! This is so different from typical travel photographs. 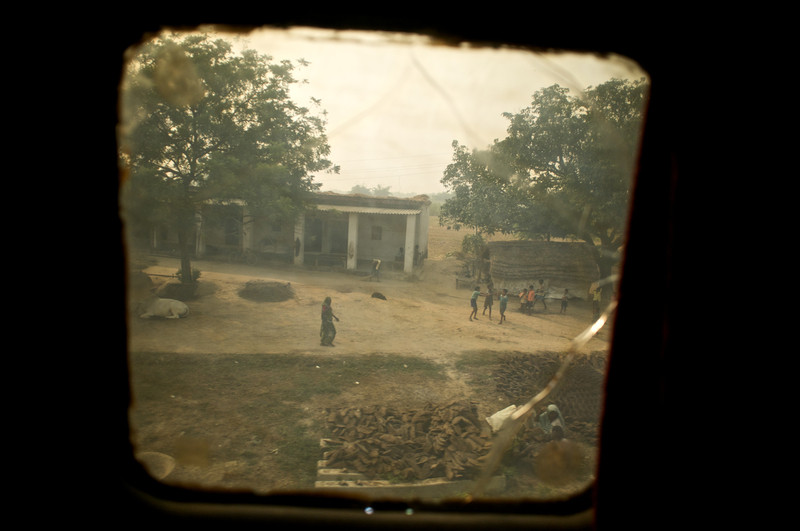 Loved the brilliant use of the window frame…it give’s a glimpse of the everyday lives of the people along the train tracks, it so honest and intimate and yet the window reveals the distance between a different world out there. Much inspired by your work. Cheers. I appreciate your kind words. This is definitely one of my most favorite posts for reasons you mentioned. I wanted to do something real to me, not typical travel photography, and I loved the glimpse into everyday life, people being observed without even realizing it, being very natural. Thanks again Kazi.